POINT LOOKOUT, MO. 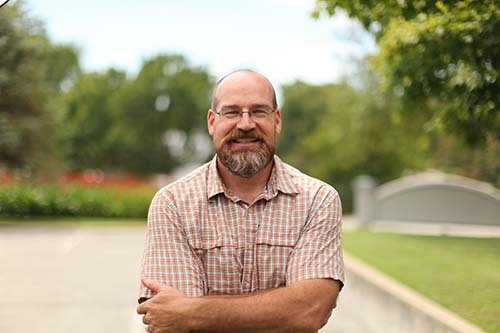 — John Anderson, associate professor of agriculture, received the College of the Ozarks New Faculty Member Five-Fold Mission Award at the 2019 awards assembly on April 3. Anderson, an alumnus of the College, joined the faculty in 2016. He currently serves as chair of the division of business, applied, and technical sciences and general farm manager for the College. Anderson earned his master’s degree in agriculture from Arkansas State University and a doctorate in agricultural economics from Oklahoma State University. Before coming to the College, he worked for many years with the American Farm Bureau Federation and also was a faculty member at the University of Kentucky and Mississippi State University. The C of O New Faculty Member Five-Fold Mission Award is given to a new faculty member who has worked six years or less and whom students and co-workers recognize as best embodying the College’s academic, vocational, Christian, patriotic, and cultural goals. The Keeter Center — the College’s award winning lodge, restaurant, and conference facility — was ranked a Top Small Hotel in the U.S. by TripAdvisor for 2019. It features historic lodging, fine dining, and meeting rooms. With more than 350 student workers, it is the largest workstation on campus. Follow College of the Ozarks at www.facebook.com/collegeoftheozarks or on Twitter @CofOHardWorkU.